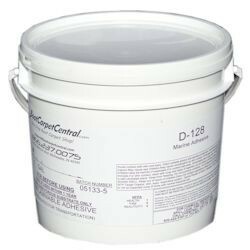 This Water Based Vinyl Adhesive is specifically designed for wood surfaces. One gallon will cover an 8' x 10' section, or 80 square feet. If you have a 20' pontoon boat, two gallons of glue will be enough glue to cover the entire floor of your boat. Please make sure you have enough glue for your project, as too little glue will cause your flooring to bubble, wrinkle or will not create the bond you need. It is VERY IMPORTANT that this glue does NOT FREEZE (neither before you use it, nor during the curing/drying process.) Please allow 24-48Hrs for this glue to set up and dry before walking or setting pontoon furniture back on the boat. The ideal temperature for using this glue during your vinyl flooring installation is 60-90 degrees F. If it is too cold, the glue will not dry properly. This Vinyl Flooring Adhesive is more expensive than most but it has been specially formulated to bond to the back of our vinyl flooring. 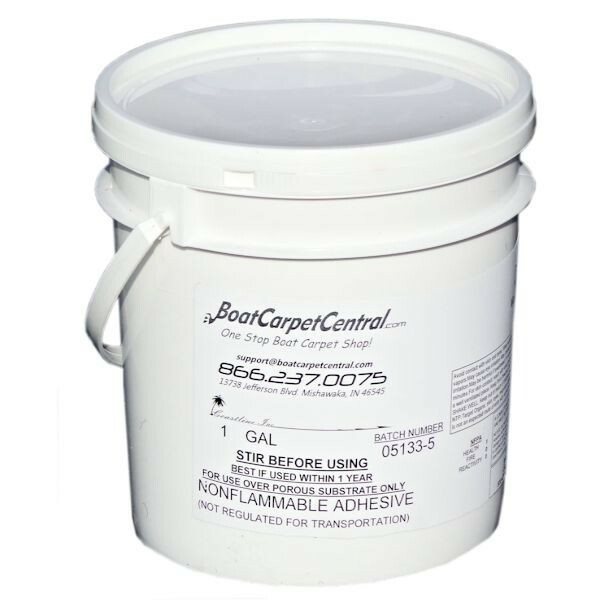 Vinyl flooring glue is different than boat carpet glue. 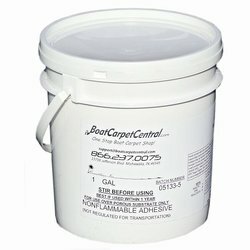 Vinyl flooring does not breathe as well as boat carpet. 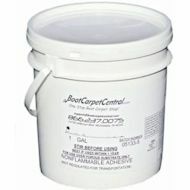 By using the proper glue, it will work with marine plywood and the vinyl flooring in order to create the correct bond. Other types of adhesive can cause discoloration to the vinyl flooring or eat the back of the vinyl flooring away. We highly recommend reading through the instructions completely prior to beginning your installation.